Last week I was in Indiana for the National Preservation Conference – the National Trust’s annual gathering of preservationists from around the country. I’ve been in this field for quite some time, and this year marked my 37th conference. I’ve seen and heard a great deal at these sessions…but I can’t recall how long it has been since I was as moved as I was by Will Miller’s closing remarks at last Saturday’s luncheon in Columbus, Indiana. The story of how industrialist J. Irwin Miller and the Cummins Engine Foundation came to pay the architectural fees for public buildings designed by world-class architects has been told countless times. Architecture buffs and cultural travelers now flock to Columbus by the millions annually to see some 70 modernist buildings along with a Victorian Main Street and historic neighborhoods. This treasure trove led to the community’s ranking as sixth in the nation for architectural influence and innovation by the American Institute of Architects. 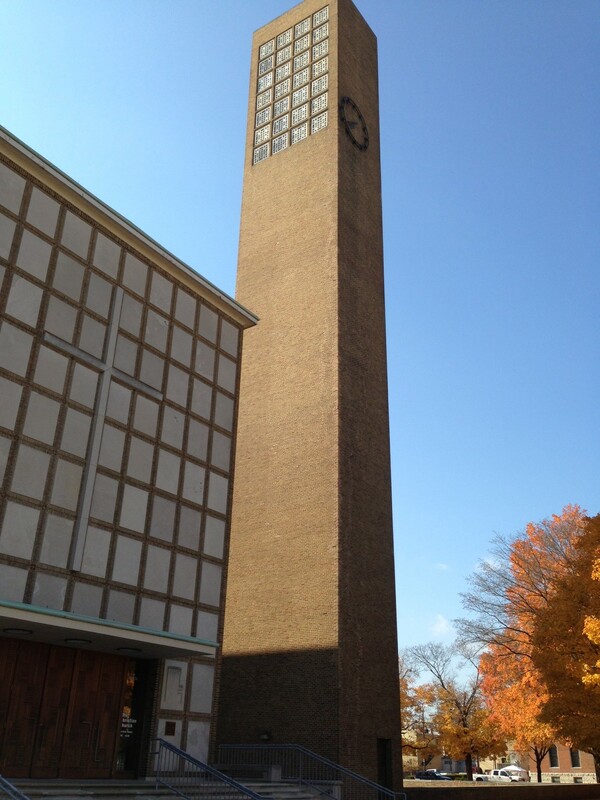 The community includes buildings such as the First Christian Church (shown at the top of the post), designed by Eliel Saarinen and which today is a National Historic Landmark – designated because it stands as one of the first modernist churches in America. And if Will Miller – Irwin Miller’s son and the president of the Wallace Foundation – had simply regaled us with stories of how famous architects came to transform this small, Midwestern industrial town, we would have been delighted. But Miller went much deeper than architecture and community revitalization, turning instead to the process and community values that have made this such a wonderful place to live and work. In 30 minutes time, Miller took us through a tour of nine rural Indiana towns that were comparable to Columbus in 1950 and then examined community factors such as population and work force growth, unemployment, and growth in real income, Eight of the towns had remarkably similar histories from 1950 through 2012. But Columbus – which didn’t stand out from the others except for the fact that a set of community values and a process to support those values came into being in the 1950s – significantly out-performed the peer group in every measure. Significantly out-performed them. The link above goes to a similar talk Miller gave last year to the Columbus Human Rights Commission Annual Dinner. You’ll enjoy seeing the basics of the conversation we had last Saturday with Miller. For our presentation, given on a beautiful fall day in this town of less than 50,000, Miller ended with a short speech from his father on the occasion in 1964 of the dedication of the Otter Creek Golf Course – a magnificent public golf course designed by Robert Trent Jones. The Cummins Foundation had – yes – paid the fees for the internationally renowned Jones because they felt that every member of the public, and not just the wealthy, deserved the best. An intolerance for turning a blind eye to poverty and poor living conditions. Today, when we have the cynical pursuit of personal advantage and wealth by so many of our so-called “leaders,” how wonderful it would be if our communities – and our country – decided that lifting all boats was a better path forward. Such a vision recognizes that talented people – who come in all races, genders, political orientation, or “all packages” as Will Miller states it – are attracted to places with “great educational opportunities, leisure and cultural opportunities, and a welcoming culture.” The architecture was a piece of the puzzle in Columbus, as it has been in other communities, but it is only one part. Architecture – and preservation – work in service to great communities. Being reminded that servant leadership works…what a terrific way to end a wonderful week in Indiana.